rick clocktower pic, originally uploaded by jahansell. 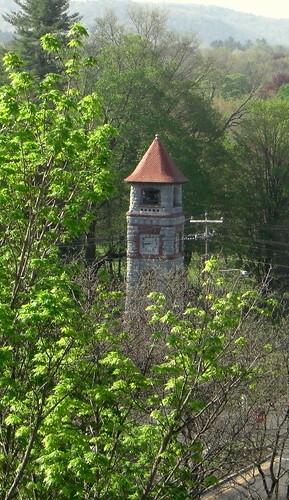 This great view of the clocktower, taken from 80 feet up in the air, was taken by my friend Rick. He was volunteering at the Congregational Church and went up on one of those "skyworkers." I've been in those before - I'd be gripping the side of it too tight to be able to take any pictures, so thanks, Rick! Brave Man!!! I wouldn't fancy it myself. He's taken a great photo though. A distinct taste of Sintra from this place; a tower surrounded by trees. However, the similarity ends with the colour of the trees & the the height of the tower.